A note from Darlene: Every once in a while, I like having Paul write a review for me. I don’t encourage him to eat fast food but sometimes it’s one less post for me to write. 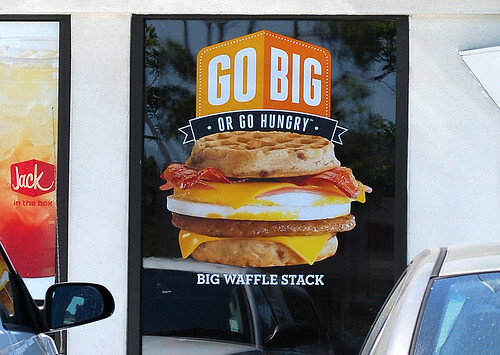 Go Big Or Go Hungry is Jack in the Box’s rallying cry for its new large-size burgers and sandwiches, including the Big Waffle Stack. Tempted by a sandwich that uses waffles instead of bread, I hit the drive-thru and ordered one… but an error on my part left me with the smaller Waffle Breakfast Sandwich instead. I shrugged and decided to give this a try anyway. This newish incarnation from Jack in the Box seems to be their offering using waffles such as Taco Bell’s Waffle Tacos and Popeyes Chicken Waffle Tenders. Here’s what you get: One a sausage patty, egg over medium and an American cheese single between two soft (think toaster-style) waffles. 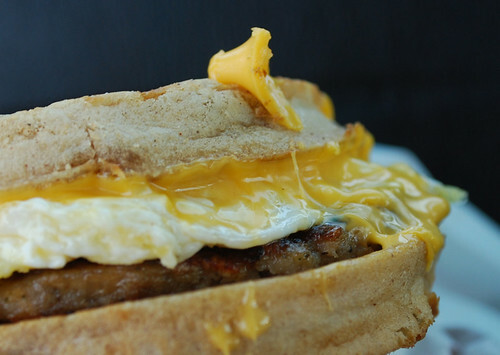 If you’ve ever had one of Jack’s sausage-egg-and-cheese whatevers (muffin, croissant), you’ll have a good idea of what to expect with your first bite. I prefer Jack’s sausage and egg to McDonald’s. It might boil down to what kind of burps or farts I have later in the day. (Aw, c’mon. You know you were thinking the same thing.) I’m glad there’s no syrup — and none was offered — because the plain waffle was sweet enough. The savory and sweet worked surprisingly well together. It’s a decent mid-sized breakfast sandwich. According to the website, it’s 470 calories (298 from fat). Determined to accept Jack’s challenge, a week later I ordered the Go Big version: The Big Waffle Stack takes the Waffle Breakfast Sandwich and adds another egg, another slice of cheese, strips of bacon and a slice of ham. 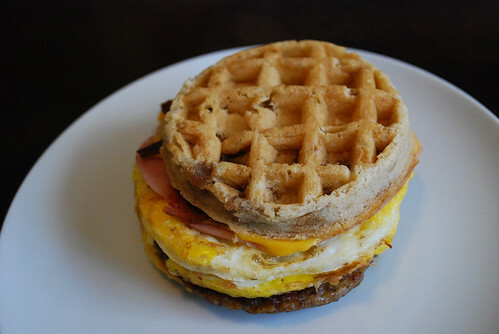 In fact, it goes like this: Waffle, cheese, bacon, ham, egg, egg, sausage, cheese, waffle. It doesn’t taste vastly different from its smaller sibling (I didn’t even notice the ham), aside from the addition of bacon. Mine was crispy and added a bit more texture. This one clocks in at 655 calories (416 from fat). That’s at least 100 calories more than a McDonald’s Sausage, Egg & Cheese McGriddle. Though, to be fair, Jack does throw on ham and bacon. That one indeed kept me full for several hours. Both versions left me with “cheese paper” (the extra melted cheese that sticks to the wrapper). And here’s a Pro Tip: Let it rest 5-10 minutes between ordering and eating so the flavors can co-mingle and the searing hot sausage and egg can cool off a bit. Makes for a better eating experience. You can get either of these 24/7 (depending on your local Jack’s hours) since Jack serves its breakfast menu all day. 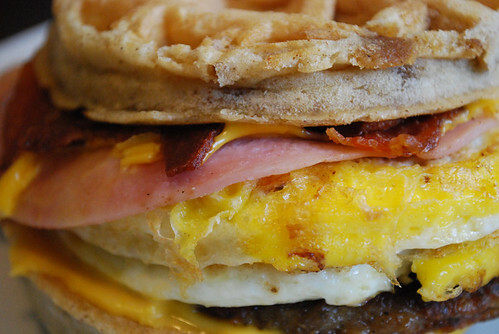 The Waffle Breakfast Sandwich is $2.69 and The Big Waffle Stack is $3.39. Both sandwiches are currently available at Jack in the Box. I haven’t been to Jack in the Crack for nearly 2 decades. 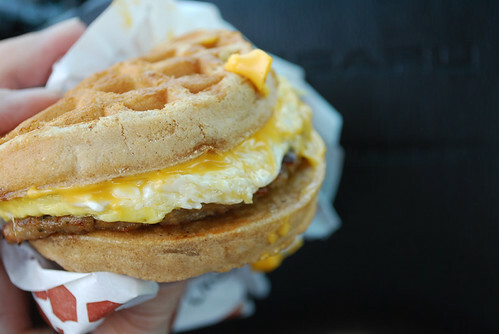 Well now…I just may try this waffle sandwich (the smaller one) based on this post! Sold!